Quadcopter Profiling of Ozone and Meteorological Parameters | Technical and Business Systems Inc. In recent years there have been significant advances in the technology, performance and affordability of small Unmanned Aerial Vehicles (UAVs). Because of these advances, they have been demonstrated to provide a versatile sampling platform for a wide variety of environmental measurements. T&B Systems has recently developed and tested a platform based on quadcopters. Data collected using this platform include meteorology, air quality, high definition video and other information using specially adapted sensors that are similar to what can be used on tethered or free-flight balloons. The difference is that the tether is removed, allowing a controlled flight to areas of interest based on visual images and telemetry of real-time data to a ground station displayed on a flight control screen. Autonomous modes can be flown with pre-programmed flight paths and waypoints to repetitively document environmental changes over time. An example of vertical profiles of ozone and temperature obtained during winter in southern California is shown below. Ozone was measured using a 2B Tech Personal Ozone Monitor (POM). 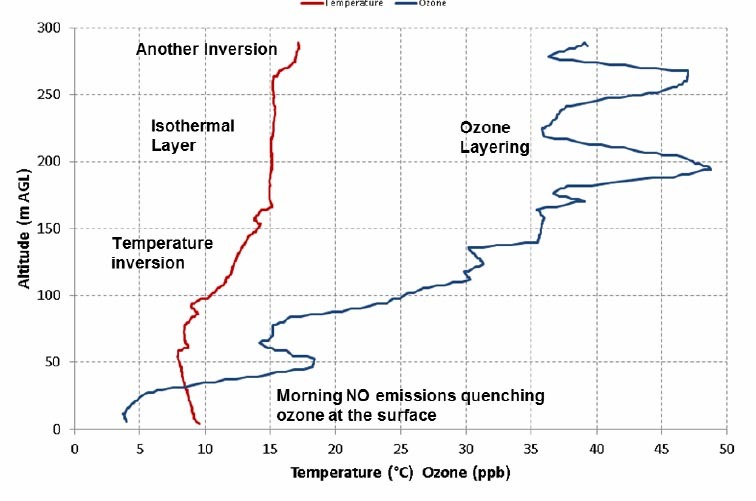 These data show a low lying temperature inversion near the ground and very low ozone near the surface . Ozone is much higher, however, within a few hundred meters of the surface, and the complex layering of the atmosphere is evident in the temperature and ozone profiles. Unlike fixed wing platforms, the multi-rotor systems can also be “parked” with high precision at an X-Y-Z coordinate for measurements over a time period to collect integrated particulate or gaseous samples, or visibly document air quality conditions, such as the location of a visible plume. Additionally, methods are being developed for the measurements of winds using the technology this platform provides. Because of the promising future of UAV platforms for studies of air pollution, T&B Systems has acquired multiple systems and is continuously working with them to develop instrumentation, data links and applications. For more information about applications of UAV platforms for air pollution meteorological studies, please contact T&B Systems.